FLIP: Both players discard their entire hands, then draw 5 cards. This card has 2 alternate versions, “Ancient Jar”, and a retrained counterpart, “Morphing Jar 2”. This card’s effect is nearly identical to the anime effect of “Card of Sanctity”. This card may be inspired by the Mimic, a popular enemy in RPG games, which is a fiend that masquerades as a treasure chest. 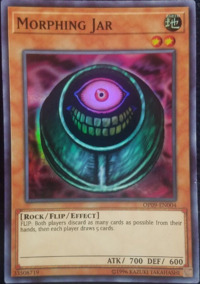 If there are fewer than 5 cards in the Deck of either player when this card's Flip Effect is activated, that player will lose the Duel, since the text of this card says "draw". Desert Sunlight:" If you have a face-up Flip Effect monster, you can activate "Desert Sunlight", and chain "Book of Moon", another "Desert Sunlight", and another "Book of Moon". When the chain resolves, you will flip the monster down, then up, then down, then back up. The Flip Effect activates twice, and they wait to create a new chain after the current one resolves. 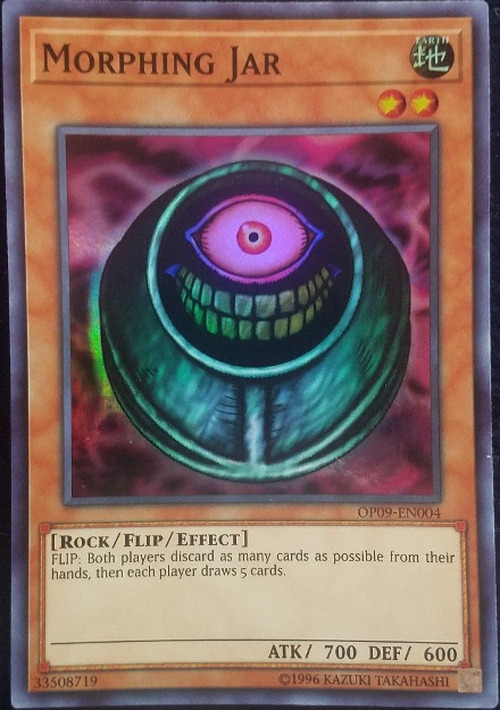 For example, if the Flip Effect monster is "Morphing Jar", its effect will activate twice in a chain, as Chain Link 1 and Chain Link 2, they resolve in reverse order, and both players will discard and draw 5 cards, then discard and draw 5 cards again. Gravekeeper's Watcher:" You cannot activate "Gravekeeper's Watcher" during the Damage Step (such as against a "Morphing Jar" that is flipped by an attack). Gravekeeper's Watcher:" When "Morphing Jar" is Flip Summoned, you may chain the effect of "Gravekeeper's Watcher", negating the Flip Effect of "Morphing Jar" and destroying it. Magical Thorn:" The effect of "Magical Thorn" is applied when the opponent discards during the End Phase to make their hand size 6discarding for card effects such as"Morphing Jar"
Magical Thorn:" The effect of "Magical Thorn" inflicts damage after an effect resolves. So if the effect of "Morphing Jar" is activated, the damage will be dealt after the new cards are drawn. This means if your opponent has 100 Life Points, and you have "Magical Thorn" active on the field but only one card left in your Deck, you will lose the Duel before the effect of "Magical Thorn" can deal damage to reduce your opponent's Life Points to 0. Night Assailant:" "Night Assailant"s effect activates when sent to the Graveyard by "Morphing Jar"
Muko:" You cannot chain "Null and Void" to"Morphing Jar"
Peten the Dark Clown:" If "Peten the Dark Clown" is discarded because of "Morphing Jar"the last thing that happened was that both players drew cards. So the effect of "Peten" does not activate. Protector of the Sanctuary:" If "Protector of the Sanctuary" is on the field, then Flip Effects like "Morphing Jar" will still activate because they must activate when the monster is flipped (whether it was Flip Summoned, flipped by an attack, or flipped by "Book of Taiyou", etc.). Protector of the Sanctuary:" If "Morphing Jar"s effect activates, then both players discard their hands, but if you control "Protector of the Sanctuary", your opponent does not draw a new hand. Regenerating Mummy:" "Regenerating Mummy"s effect will activate when sent to the Graveyard by the effect of "Morphing Jar"